Symposium Technologies in association with ESC has been chosen to provide computerized fire alarm monitoring for Canadian Forces Base Gagetown, a major military installation on Canada’s eastern seaboard. 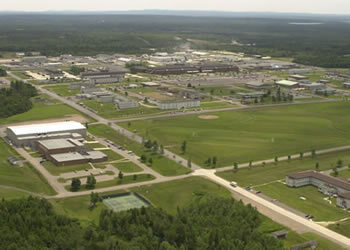 CFB Gagetown is a sprawling facility of over 1100 square kilometers, and is home to military units such as 2nd Battalion Royal Canadian Regiment, 4th Air Defence Regiment, 4th Engineer Support Regiment, and 403 Helicopter Squadron. As well, Gagetown is the center for many army-based training centers, including schools for Infantry, Armour, Engineering, Tactics and Artillery. With over 3500 permanent military and civilian employees, CFB Gagetown is also one of the biggest employers in the region. The Fire Monitoring system will provide the base with 24/7 automated monitoring for over 150 buildings, including sensitive installations such as vehicle depots, hangars, radar stations, and facilities for weapons and ammunition storage. Alarms are generated when different types of fire detection devices such as smoke and heat sensors send an alarm signal to the receiver, which is in turn interfaced with the Horizon EME. When an alarm is received the EME alerts the monitoring personnel, displaying the address, map location, and type of alarm, as well as premise-specific information such as building schematics, and location of the alarm within the structure. Other critical information – such as whether HAZMAT or explosives are present – is available for each specific area, greatly enhancing responder safety and effectiveness. As well, personnel can interact with the in-field devices through the system to perform maintenance and administration of the entire sensor network, shunting alarms, polling and querying devices, carrying out tests, and monitoring whether detectors are working normally. Going forward, CFB Gagetown’s Horizon EME installation can be easily expanded to provide a host of additional capabilities, including security monitoring, dispatching, CCTV, GPS, and mobile data. The result is a uniquely flexible emergency management solution that provides the highest levels of safety, security, and monitoring, 24/7. CFB Gagetown represents yet another success for Symposium, as interest in the Horizon EME continues to build steadily in military and associated government circles throughout North America. Currently, Symposium provides solutions for several major military installations, with yet more contract announcements expected in the coming months. According to Robert Day, “The growth in our defense and homeland security business is following the same track and progression as our public safety business. It’s based on listening closely to what clients need, building products that reflect those needs to the highest degree, and delivering exactly what we say we will, on time and on budget.” It’s also based on working closely and successfully with other companies to deliver the full solution. For Gagetown, Symposium will be working again with Electronic Surveillance Corporation, which provides the specialized in-field detection devices and alarm receiver hardware that are integrated with the Horizon EME. As ESC’s President, Gordon E. Duggan says, “Working with Symposium greatly increases the overall success of the project. Their capability and professionalism ensure a superior solution, which in turn ensures a much more satisfied customer”. For its part, Symposium is proud to continue deepening its relationship with the Canadian armed forces, and looks forward to putting in place a system that makes CFB Gagetown a more secure and safe environment, thereby helping Canadian soldiers fulfill their mission of creating a safer and more secure world.